We love elevating our community, which is why we're so excited to bring Latina Makers Market back for #WeAllGrow Summit 2017! We're looking forward to our attendees meeting the creatives who will be showcasing all their amazing designs. Everything will be available for purchase so make sure to get in a little shopping during the weekend. For a little sneak peak, take a look at who will be joining us and get to know a little more about them! Alma Vistoso combines the timeless aesthetic of Mayan textiles with modern design to create high-quality bags and swimwear for adventures at the beach and beyond. The brand is inspired by sharing the indigenous artwork of Guatemala and the Mayan culture to people all over the world! They strive to bring together something ancient and something new, to build a sustainable lifestyle brand that supports the artisans of Guatemala, as well as the economies of the U.S. and Los Angeles! Myra Brooks is CHIC-IATA. Yes, that's chic and piñata! Her designs are inspired by fashion and made with colors and textures that are on trend right now. After Myra had her son and decided to leave her brokerage job behind, she was left with an itch to create. CHIC-IATA was born from her love of her culture, family and, of course, all things that sparkle! Folk Project embodies the encounter of two worlds and the result is the syncretism of traditional costumes and home décor accent pieces. The mission of the project is to travel the world looking for unique textiles and turning them into bespoke decorative pieces, such as furniture and accessories. Folk Project uses a raw material known as the huipil, which is an essential piece of the Guatemalan and Mexican traditional costumes. Every huipil is bought at a fair price from the artists in order to promote the survival of their traditions. Merijam Roelofs, the designer behind the brand, said the company aims to highlight the creative work of the indigenous woman who often remains invisible to modern society. By using huipil in the world of modern living, the brand hopes to showcase their craft on a global platform and give them the acknowledgement they deserve. Folk Project is all about introducing a piece of the traditional world to the modern one, in turn creating a refreshing design unique to the global living style. 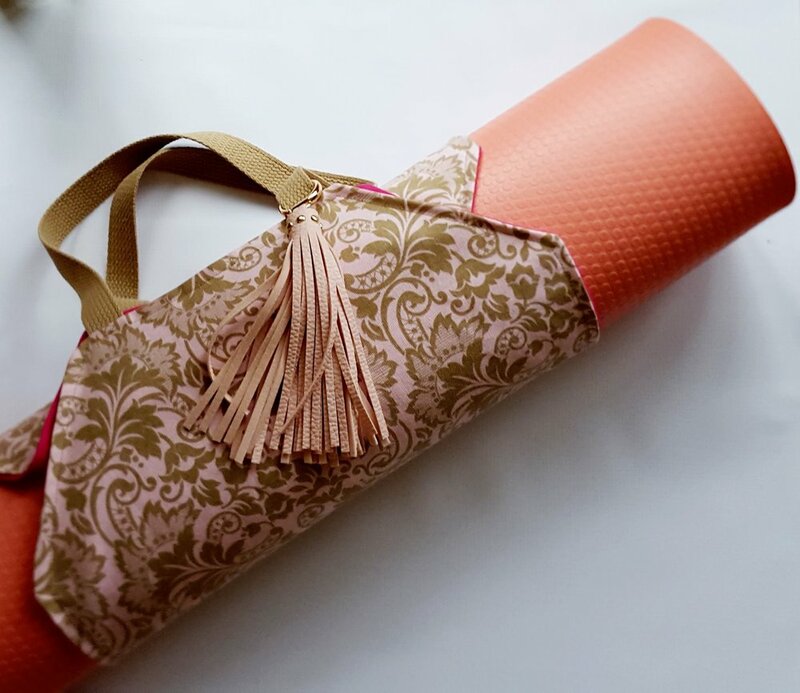 Helena Osorio of Handmade by Helena sews fun and useful items for travel and for carrying your yoga mat or spinning (gym) shoes in style. No more bringing back home your dirty laundry in a plastic bag! Most of the fabrics she uses are cotton and the ones with dichos are all printed in the USA. Helena's grandmother used to be a seamstress and she supported and put 5 kids through college by sewing. Two years ago, she bought Helena a sewing machine and taught her the basics. At the time, Helena had no idea that she was given a never-ending outlet of creativity. The process of sewing sometimes feels tedious, complicated and long but nothing beats the feeling of love, happiness and accomplishment that flows through you when you hold the finished product in your hands! Homegirl Por Vida is your homegirl Xenia Galaviz offering metaphysical tools to help you on your path into spiritual gangsterism. Xenia is the first in her family to start a small biz. Therefore, she wanted to shatter the stereotype of being a homegirl, proving that a dollar + a dream is real for every homegirl. Where she comes from, where she's going and what she wants to see keeps her at it 24/7/365. Ix Style (pronounced "eye ex") started as a simple idea to help one woman artisan and morphed into working with over 600 women around Lake Atitlan. Ix Style is a charitable fashion company that sells huarache sandals, handbags and jewelry made by Guatemalan artisans. For every purchase, the company donates to provide clean drinking water to children in Guatemala. Francesca Kennedy's mission began when she returned to visit her grandparents at Lake Atitlán in Guatemala in 2010. The lake had became so completely overrun with blue-green algae that the water looked like sewage. The image of young girls collecting the contaminated water to drink, cook and clean remained with her, later providing the catalyst for starting her own socially-conscious fashion brand: Ix Style. Las Conchitas by Ruby Wright are handmade goods inspired by Mexican sweet bread. When it comes to creating, Ruby finds that crafting and trying new things challenges her to be creative and relieve stress. She's inspired by new techniques, styles and her heritage. Overall, Ruby finds satisfaction in making things that others will love just as much! Lucy M. Wilson & Maria Calle are the creators behind Lasso is Love, handmade jewelry based out of Los Angeles. Lasso is Love is all about jewelry making a statement in a casual way. The company is inspired by friendship and meanings of life. Their jewelry makes a contemporary statement of functionality and style. Pearmama is a site for Latina women, mothers and creative spirits navigating life and love in a real, authentic way. Denise Cortes, the mastermind behind the brand, said that Frida Kahlo has been her muse for a long time. Kahlo's strength of character, her unconventional beauty and the ability to transcend great physical and emotional pain draws Denise to her, which inspired Denise to create these pieces. They're like small jewels in the hands of Frida-philes and art lovers alike. Maura Hernandez is the innovator behind Pressed Intentions, an Etsy store that sells fine handmade stationery and gifts. Maura loves to create beautiful, inspiring and funny items to spread love and kindness. She's inspired by mindfulness, popular culture and a wicked sense of humor. Jessica Resendíz of Raggedy Tiff says her brand represents cultura, pride and the beauty of handmade items and craftsmanship. She is a first generation attending college in order to pursue her fashion career. She owes it to her hard working parents, who immigrated to the States for a better life and opportunities. Being a proud Mexicana in the fashion industry has been a challenge for her but with determination, hard work and dedication, she believes que todo se puede. Her family and her 11-year-old daughter are her motivation. They keep her striving and showing the world that anything is possible, no matter where you come from or who you are. Sweet Llamita helps women express how they truly feel by creating beautiful and culturally-relevant paper designs for everyday and special occasions. Brenda Castillo derives inspiration from the beauty of good design, both the English and Spanish languages, and the cultural richness of Latin America. A simple font or illustration has the ability to evoke various emotions and finding a good balance between good design and cultural relevance can create powerful reactions. If her products can melt hearts, induce chuckles, or inspire, then she's done her job. Viva Greetings manufactures and distributes Mexican themed greeting cards, gifts and party goods. Carla Fonseca finds inspiration in her heritage, in her culture and in Mexico. The colors, the traditions and the diversity of such factors bring out the creative elements in her designs. Christina Ghadieh is the creative soul behind Woven Wanderland who designs modern macrame for your inspired home. Christina has always been artistic. Upon recent rediscovery of macrame, she fell in love with its whimsical aesthetic. For her, the creation of each piece is s meditative process. She hopes her work can create a mindful place of happy thought for others. 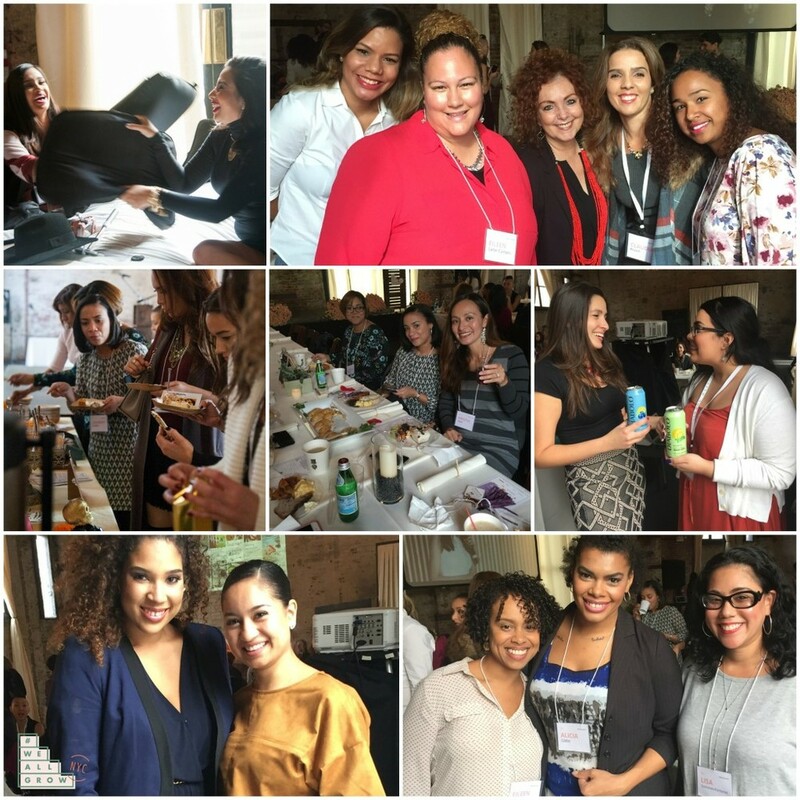 When we set out to produce a one-day event in Miami we knew it was a place where the spirit of #WeAllGrow would be welcomed and celebrated, but consider us blown away by the incredible group of badass Latina women that are bringing it to life. The agenda for our sold-out event has something for everyone wanting to grow their digital business skills, be inspired and do it all while looking and feeling divinas with all the thoughtful treats and surprises from our sponsors. The rise of female entrepreneurship is researched to be impacting global markets in record numbers. Women all over the world are growing businesses and brands, connecting communities and changing the status quo in business. You can see these impacts online in BIG ways! The Latina #BossLadies with us today are exciting examples of success that comes with guts and incredible work ethic. Marketing products on social media, engaging clients and customers with inspiring digital brands and owning it on their terms makes these Latinas the ultimate #BossLadies. Join us as we discuss the unique challenges of female entrepreneurship, how to scale your business to create wealth and the current social media trends impacting the next generation of female bosses. Thank you to Chase Slate for sponsoring this panel. Gaby Espino and Luz María Doria sit down for an intimate chat on staying motivated, facing our fears head on and going after our dreams as a multi-faceted woman taking on the roles of entrepreneur, celebrity and mom. After the lights of their day jobs are off, these Latina powerhouses continue to influence audiences through successful blogs and online channels. Take a sneak peek behind the screens and learn the secrets that celebrity influencers utilize to cement their persona onto the hearts of audiences. Our panel of professional journalists and hosts effectively curate voices and brands that audiences connect to, while also balancing the marriage between on-air celebrity and social media intimacy. We’re excited to learn the secrets to maintaining both authority and relevance at this exciting panel of celebrity influencers. Special thanks to Hola! USA for sponsoring this session. Cristy Marrero leads a chat with Alejandra Espinoza where we'll learn more about her ascending career path and how she's breaking through to Hollywood as a power Latina, all while maintaining a strong connection with her fans via social media. Check out all our incredible speakers here. But we didn't want to give you the typical Miami experience. We're taking you to Little River Studios: They've been used for Anthropologie, Vogue and many other high-end photo shoots. Get your #OOTD and camera ready because there will be almost too many Instagram-worthy moments of sisterhood at #WeAllGrowMIA. But that's not all. We're going to have Keynote speakers, Mentor roundtable chats, breakout sessions, breakfast, lunch, a happy hour, and so much swag all geared towards helping our community of Latina bloggers and creators grow. When one grows, we all grow. We cannot wait to experience the energy of sisterhood with you at #WeAllGrowMIA. We’re excited to announce that #WeAllGrow Cities was a huge success! We started in New York with #WeAllGrowNYC and then made our way back west for the Los Angeles version of brunching, learning and networking at LA’s trendy and chic Studio 1342. The space provided the perfect landscape to showcase #WeAllGrowLA with its open-beamed ceilings, natural light, and greenery serving as a unique backdrop. Oh, and did we mention it was a perfect 76 degrees?The schedule for the day was very similar to to our Brooklyn half-day workshop but of course in #WeAllGrow fashion we added a few special things to the mix for our west coast amigas. #WeAllGrowLA welcomed Latina influencers with an opening Mentor Q&A Panel, “Ahead of the Curve: Standing out through the power of Trendcasting” with Trendsetters Roxy Limon, Claudia Felix-Garay, and Alexys Gabrielle. They shared their thoughts about trends and classic pieces along with how they go about finding the best deal. Following the Q&A panel, we continued with day with networking breaks and mentor chats starting with Founder and CEO of RLPR, Roxana Lissa, who presented “Going Beyond your Online Presence” to our attendees. We also had Pinterest Community Manager, Sara Martineau, on board to talk about the “Power of Pinning,” along with an inspirational presentation by Davina Ferreira, Publisher of Alegria Bilingual Magazine, where she talked about “Creating Bilingual Content for our Higher Self.” We ended our sessions of the day with lessons in “Visual Storytelling and Branding with Instagram” presented by our very own Rachel Matos of theArtMuse and Latina Bloggers Connect. We feel a tremendous amount of gratitude for every sponsor who joins us on all #WeAllGrow events. Without them, none of this could be possible. Celebrity beauty expert, Peter Lamas, hosted a beauty lounge complete with hand spa treatment while French-inspired all natural sparkling refreshment Diabolo Beverages kept everyone refreshed throughout the day with tasty mocktails. The sweetness continued with a Sweet Bar provided by SuperMama’s Podcast and a cocktail hour sponsored by Avión Tequila. We’re also grateful for the contributions provided by Dove Dry Spray Antiperspirant and St. Jude Children’s Research Hospital. Best food EVERChef Eddie Ruiz of Corazón y Miel was on board to make the day savory with a delectable brunch that satisfied even the most pickiest of eaters. Guests enjoyed a delicious brunch that included a Fall Frittata with Chicken, Winter Honey Lox Toast, Spicy Chicken Enchilada Cake, and French Toast Bread Pudding with a choice of a Las Palmas Michelada or a Honey Berry Royale and Honey Leche. All recipes included our sponsors Foster Farms, Got Milk?/Toma Leche, Las Palmas Sauces & the National Honey Board. It’s not a success without the company of women who inspire us everyday to do this. It is the community’s energy, drive and determination that keeps us plugging away at our computers every day to think of new and exciting ways to keep us all inspired as we forge ahead! We introduced #LatinaMakersMarket and it was basically the best idea ever. Latina designers and shop owners in one place? Kind of amazing. #WeAllGrowLA hosted its first Latina Makers Market, featuring Latina small business owners. The inaugural market included Shop Limonada, iLaments, The Orphaned Earring, Chaca Chaka, and Mixed Up Clothing. #WeAllGrow Summit is next on the calendar. We hope to see you on March 3rd - 5th at Hotel Maya in Long Beach, CA. Buy your ticket! Make sure to follow along as well on Twitter, Facebook, Instagram and Pinterest. Five years ago, we started this journey with one simple word - community. Our goal was to connect influencers with brands and create lasting authentic relationships. Today, we continue to share that message of unity and growth. Taking our “when one grows, we all grow” mantra on the road inaugurating our #WeAllGrow cities power brunches. Debuting in New York City, so many came out to meet with amazing creatives and Mentors who shared their experiences, insights, and ingenuity on the importance of telling YOUR story, YOUR way. Being smart and savvy chief communicators and becoming powerhouse brands were just some of the invaluable lessons shared by the mavens who crossed the stage that afternoon. There is nothing like bringing like-minded people together to show just what embracing your potential, being engaging, and sharing your authentic voice can get you. We had so many favorite moments of that beautiful afternoon; it was hard to pick just five. But here are some of our most memorable moments from #WeAllGrowNYC. Everyone who joined us! Despite there being a marathon and mass transit working on its wonky weekend schedule took it all in stride to join us in Brooklyn and make this day happen. We couldn’t do it without you, and we are humbled by your dedication to community, growth and success. Mentor chats. Emmelie De La Cruz, Enid Hwang, Lisa Price, Maria Chalita, and Zuania Capó, provided us all their unique perspective on what it takes to being a fierce storyteller, a communication powerhouse, and above all else, an accessible voice in the social space. We learned and how to value our strength through authenticity. Networking breaks. Those moments in between thrilling aha moments where we hugged, greeted and chatted with one another. These instances show the true value of community and sisterhood. Roundtable workshops. Seeing everyone sit and listen to the Mentors give in-depth sound advice to help us leave our mark in this space. Mentors told us what we needed to hear as opposed to what we wanted to hear. Keeping it real, while being graceful, engaging, and honest were just some of the tips shared throughout the afternoon. Sponsors. 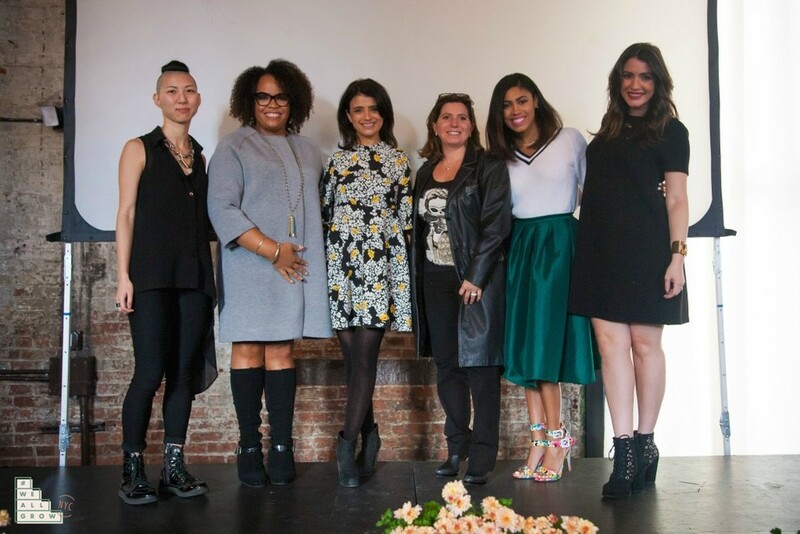 We had some amazing sponsors take part in our inaugural #WeAllGrow cities power brunch. Carol’s Daughter, Conffianz, Country Crock, Diabolo, Lipton ice tea, Night, Pinterest, Vandidades, and Vivala, Vive Mejor, all believed in our vision to help us make it a reality. Share with us, what was your most memorable moment of #WeAllGrowNYC?